WASHINGTON DC — The media’s obsession with “global warming” has now reached a new level of absurdity as concerns are now being raised that a President Donald Trump summit with North Korea “could have a negative effect on global warming.” And the media is even portraying North Korean dictator Kim Jong Un as more forward-thinking than Trump because Kim is “more in line with global thinking” on “climate change” and supports the UN Paris climate agreement. “The anticipated meeting between President Trump and North Korean dictator Kim Jong Un could put the former real estate tycoon eye to eye with a reviled autocrat who appears more in line with global thinking on one issue: climate change. North Korea is a party to the Paris Agreement, the 2015 pact that Trump plans to withdraw the United States from despite an uproar from allies around the world. That’s because if sanctions against North Korea are lifted, the hermit nation’s coal could flow onto the world market, with the bulk of it ending up in South Korea, Japan and China. The E&E article notes that North Korea is making very impressive commitments to reduce it’s CO2 emissions and featured Kim hurling insults at Trump for not staying in the UN Paris agreement. In addition, the E&E news article failed to present the most stunning image of North Korea’s dire energy poverty. 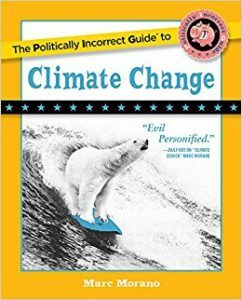 James Delingpole of Breitbart News: As Climate Depot notes, E & E News is by no means the first left-leaning publication to praise the environmental record of Kim Jong-Un. That honor goes to the Guardian for this bravura piece titled ‘North Korea: an unlikely champion in the fight against climate change’. Climate change impacts – declining availability of food, water and energy, sea level rise, migration, and extreme weather events – pile more stress onto countries already at risk from internal instability and economic weakness. Like many poor countries, North Korea, where such problems are endemic, is least able to cope with climate change impacts. These weaknesses include food insecurity, energy shortages, economic fragility and a rigid political system. North Korea’s energy security problem is well documented, revolving around four distinct challenges: supply, generation, power transmission, and secondary usage. Of these four challenges, electricity generation and transmission are the two that can be addressed through the UNFCCC. Renewable energy may be the most appropriate vehicle for increasing generation capacity because unlike large centralised fossil-fuels, renewables can be scaled locally which reduces their up-front cost. For example, a UNDP-sponsored project is installing small-scale wind energy systems at sites across North and South Pyongan Provinces, helping to alleviate energy shortages affecting these areas by decoupling them from reliance on the coal-generated electricity grid. Update: MICHAEL BASTASCH of The Daily Caller writes: Daniel Kish of the free-market Institute for Energy Research pointed out North Korea’s communist dictatorship has kept its people poor, and largely without access to electricity, for decades. Kish said the “climate media” is missing “the forest for the trees.” “North Koreans reduce carbon dioxide emissions by eating, rather than burning, twigs. That’s what central control always ends up doing,” Kish told The Daily Caller News Foundation. ‘The Daily Telegraph – March 2, 2011: ‘Era of Constant Electricity at Home is Ending, says UK power chief’Excerpt: ‘The days of permanently available electricity may be coming to an end, the head of the power network said yesterday. Families would have to get used to only using power when it was available, rather than constantly, said Steve Holliday, chief executive of National Grid. Mr Holliday was challenged over how the country would “keep the lights on” when it relied more on wind turbines as supplies of gas dwindled. Electricity provided by wind farms will increase six-fold by 2020 but critics complain they only generate on windy days.